When I was a kid, I avoided chores like the plague. Cleaning my room, watering the plants, and sweeping the floor were some of the things that I had to do on a regular basis, but nothing got my goat as much as doing the dishes. Avoiding that chore took special planning and tons of creativity, and to this day, I am the subject of jokes at home when that topic comes up. If you have children, you just might be wracking your brains as to what you can do to entice them to get their chores done. Why not take advantage of what technology has to offer? 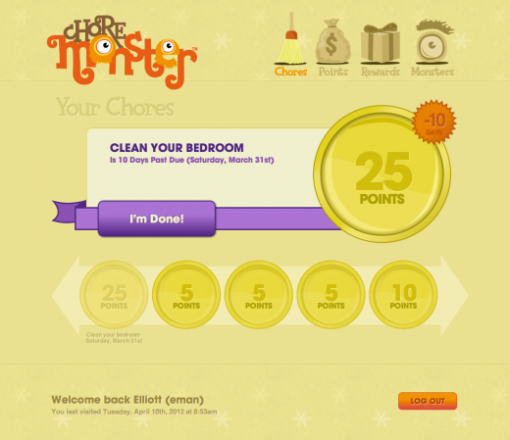 Enter ChoreMonster, a new web app which is supposed to make chores more enjoyable for kids. What ChoreMonster does is to make completing chores more of a game than a task. Isn’t that the best way to add the fun factor to experiences? With ChoreMonster, parents (or guardians or older sisters/brothers who want to lord it over the young ones) can assign tasks to be completed. Together with the assignment of the tasks, parents also allot points to each task when completed. To make rewards more tangible, on top of the points, parents can assign treats in real life. For example, if the kid’s room is cleaned up, he gets a pizza. Or something like that. ChoreMonster is currently in beta, so you have to send in your email in order to get access. However, the guys at The Next Web have a code which can get you in immediately! If your kids are already into the Internet and games (and the chances of this are really high), then ChoreMonster might make a difference. Impractical. Why would a parent or child need to log in a check if chores are done, why not just have a look at the room? Time waster.